One of the attractions that you cannot miss in your trip to Brazil is the legendary Iguaçu falls. These waterfalls are located in the border between Argentina and Brazil. The exploration of the Argentinian side is treated in the post “5 Days in Argentina”. In this one we will admire this wonder from the Brazilian side. In order to get there from Foz do Iguaçu (the nearest town), you can take the bus from Foz do Iguaçu bus station, the trip will take you 40mins. The bus will stop you in front of the Park entrance. There will be an entrance fee to pay, but after this you will enter in a wonderful park, with a very interesting flora and fauna. After a short walk you will arrive in a bus stop, where you will find some shuttles taking you to the upper side of the park: from there the walk to the falls will start. Differently from Argentina, the access to the waterfalls from Brazil is not direct, but you will have the waterfalls opposite to you. You can see them via an interesting path through the forest, where you will run into several animals and special trees. During this journey, you will see the waterfalls from several angles. In the end, you will cross a bridge that will take you in the middle of a unique show of the nature. At the end of the path, there will be another bus stop, where shuttles will take you back to the entrance. The tour will take you half a day; after your lunch break, go out of the park and at 200m you will find the Birds Park. This park hosts several species of birds typical of South America: from tucans to flamingos, from parrots to hundreds of different butterflies. Another place to visit in the area is certainly the Itaipu dam. This is one of the 7 wonders of the modern world and is located at the border with Paraguay. You can access there by a bus leaving from Foz Do Iguaçu bus station. Itaipu dam is the largest hydroelectric dam operating in terms of annual energy generation. There are organized tours that will take you in the heart of this wonder and will take you around half day. In the evening, you can take your flight to Sao Paulo, the third destination of our tour. Sao Paulo is the largest city in Brazil, counting around 20 millions of inhabitants. Despite its huge size, it is very easy to go around the city, thanks to its good transportation system. In the post, in order to facilitate your life, I’m going to mention also the stops for each destination. You can start your tour from the Avenida Paulista, the Champs Elysées of Sao Paulo. It consists indeed of a huge and long street, with plenty of shops, bars, restaurants, offices and museums. You can have an enjoyable walk in this street and stop for a visit at the MASP, the Paulista museum. You can start your walk from the metro stop “Paulista” until the height corresponding to the metro stop “Brigadeiro”. You can have your lunch in Avenida Paulista. 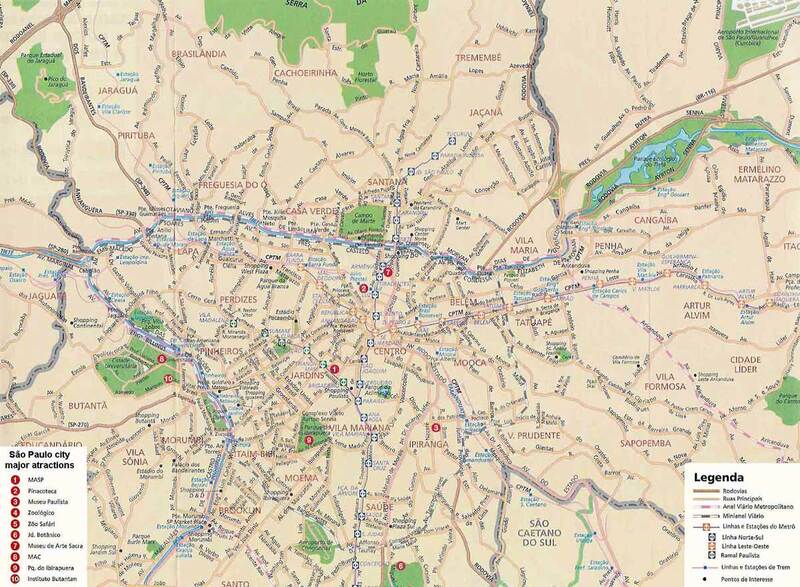 From rua Brigadeiro, take any bus going down (or if you are courageous have a walk of around 45mins) and you will arrive in Ibirapuera park, a very nice green spot in the middle of the city hosting museums, bars, and cultural activities. The second day in Sao Paulo will be dedicated to museums and very nice activities. A museum that you cannot miss is the Memorial da America Latina. Located near “Barra Funda” metro station, this incredible museum, designed by Oscar Neimeyer, is a monument to the cultural, political, social and economic integration of Latin America. The architectural complex consists of several buildings arranged around two squares. It comprises: the hall of acts, the library, the Brazilian Center of Latin American Studies, the Marta Traba Gallery of Latin American Art, the creativity pavilion, the Símon Bolívar Auditorium, and the Latin American Parliament building. You can visit most of these buildings and the artworks inside them. From the Latin America Memorial, stop to “Sao Bento” metro and you will be in the middle of the Old Town, a set of narrow and overcrowded streets that might be scary but at the same time very charming. Among these streets is the Mercado Municipal, the town market. In this indoor market you will find interesting kiosks selling any kind of food. This is the ideal place to grab something for lunch. After a lunch break stop to the metro “Sé” to admire the city cathedral, a very nice church located in a vibrant area. Now take the metro again and stop at “Luz” to visit two great museums: the Museo da Lingua Portuguesa and the Pinacoteca. The first is an interactive museum that honors and explain the origin of the Portuguese language; the second one hosts several artworks from South American and European painters. On the first day, you can have a quick tour in Centro, the old town. There, you will find small streets with plenty of people, shops and bars. The central area of Rio is not really nice – it is quite dirty and in some areas quite dangerous – but it is worth having a quick tour. In the centre you will also find the cathedral, famous for its very strange conic shape and famous for the fact of being an “open” church, with no door. Inside it’s dark but with huge colorful glasses. From Centro walk to Lapa, another neighborhood that gets live especially at night. The entrance of Lapa is marked by old arches. Just after these arches you will find the famous Escadaria Selaron. These are steps created by the Chilean-born artist Jorge Selaron who claimed it as “my tribute to the Brazilian people”. There are 250 steps measuring 125 metres long which are covered in over 2000 tiles collected from over 60 countries around the world. The show of colors is amazing and represents in the best way the color of Brazil and its people. On the 2nd day in Rio, we are going to see the most famous attractions of the city. Arrive in Corcovado station and take the funicular taking you to the place with the best view ever. This is the place where you will find the Cristo Redentor statue. This is an art deco artwork measuring 80m height. From the same location you will have access to an amazing view on the entire city. After this great moment, take the funicular back and cross the entire city, till Utca, where the Sugar Loaf is. This is a peak of 396 metres that can be reached via a funicular and via a very interesting path. Indeed, the first part consists of a walk up on a small mountain, where you can admire the fantastic variety of flora and fauna. The journey is quite hard, so wear comfortable shoes! Once you are up you already can admire a stunning view of the city and of the sea..but if you want to have a even better view take the funicular from there and go to the Sugar Loaf. The day has been very busy, lots of things to do and to see. Now it’s time to enjoy Rio’s nightlife! 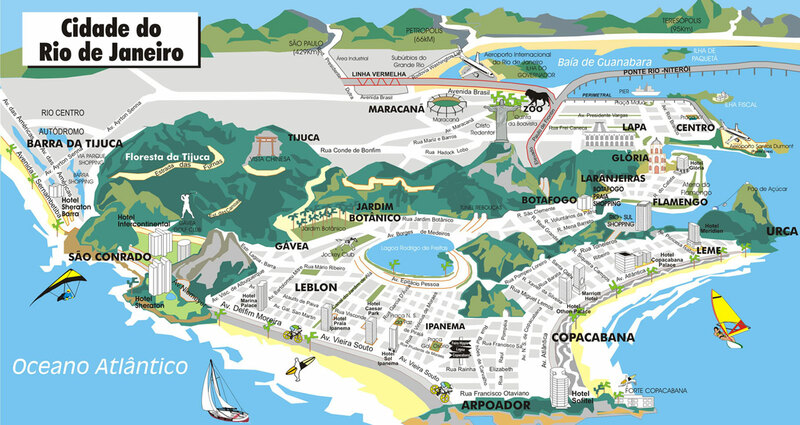 For this, you can go to Lapa or you can stay near the beach, in Copacabana or Ipanema and have a great time! You cannot be in Rio and not visit the beach. Everybody in the world knows the famous sandy beaches of Copacabana or Ipanema. Also, if you went out the night before for sure you went back to the hotel quite late, therefore we are going to take the last day of Rio very easily. You can indeed spend your entire day on the seaside: if you want to sunbath, if you want to go for a swim, if you want to have a walk, if you want to play some sport, if you want to go by bike, the beaches of Ipanema and Copacabana are the places to be. Enjoy the great atmosphere of the beaches in Rio. If you are tired of the beaches, you can visit the Modern Art Museum for the art lovers, or the Maracana stadium for the football fans, or explore the Tijuca Forest National Park for the nature lovers.